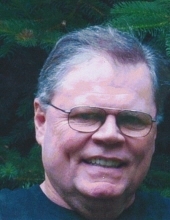 Ronald E. Dirker, of Brighton, died peacefully on January 15, 2017, surrounded by his family after a valiant battle with cancer. He is survived by his wife of thirty five years, Denise; son, Nicholas and daughter, Kristina; his mother, Marian; brother, Jim (Debbie); his sister-in-laws, Lorna (Joe) Provonsha and Narda Ballard; his “sweetie” and canine companion, Ellie as well as nieces, nephews, extended family members and many dear friends. A Funeral Service will be held at Lynch & Sons Funeral Home, 600 E. Main Street, Brighton on Tuesday, January 17, 2017 at 3 PM, with visitation from 11 AM until the time of the service. Memorial contributions may be made in his name to the American Cancer Society. For further information phone Lynch & Sons, Brighton at 810-229-2905. "Email Address" would like to share the life celebration of Ronald Dirker. Click on the "link" to go to share a favorite memory or leave a condolence message for the family.